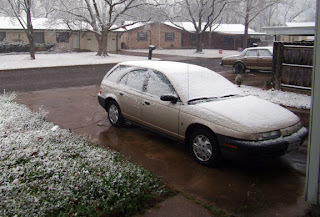 WAC Vet(eran): Snowing in Central Texas, Again. Snowing in Central Texas, Again. I'm not going anywhere. This is only the beginning. Since I took this photo a few minutes ago, the snow has gotten even thicker/deeper. I'll post more as the day goes by. I seriously need to cut back.